"Cure the Incurable" Mikhail Tombak, Ph.D. Nature has cures for all diseases. In Cure the Incurable the author suggests some successful alternative treatments of diseases written off by traditional medicine as incurable. "Can We Live 150 Years?" Mikhail Tombak, Ph.D.
One book that has already changed thousands of lives. Let it change yours too! Mikhail Tombak, Ph.D. graduated from the faculty of biology and chemistry of the Russian University. For many years he was the head of Center for Health Sciences in Moscow; also the author of several bestsellers on the subject of health and healing. Why are diet programs ineffective? Much has been written lately about ways to attain long and healthy life. Numerous miracle diets are presented, formulas are praised for their extraordinary qualities, weight-reduction and aging-reversal methods are advertised. People are led to believe that good health may be the result of taking a miraculous pill. In reality, return to full health requires many years of effort, just as our diseases are caused by many years of neglect. Full health does not depend on miraculous medication and formulas that cause weight loss or aging reversal, but on the lifestyle that is in harmony with nature. This philosophy permeates the contents of this book. The author, Mikhail Tombak, created a holistic system of maintaining good health. Before you medicate, educate yourself! The book does not contain miraculous diets; it contains simple principles for maintaining and protecting our health. There is no requirement of strict calorie counting but there are simple, obvious, and natural nutritional principles. The author emphasizes close connection between our health and the way we eat, breathe, and take care of all our physical and psychological needs. The question is not limited to nutrition only as is the case with many dieting programs. This book is intended to be a practical health maintenance guide. If you feel that your health has begun deteriorating, waste no time - start acting quickly and take better care of yourself. The sooner you start acting the speedier your health will be restored! It is important to make gradual lifestyle changes and allow your body enough time for adjustment. This toolbox of simple guidelines enables thousands of readers every day to live healthier, and more fulfilling lives. Let this book be your guide to anti aging, longevity, vibrant health, and overall wellbeing. 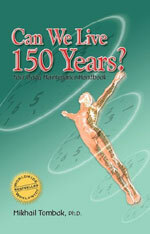 Buy "Can We Live 150 years?" and "Cure the Incurable" now! Polish- Czy Mozna Zyc 150 lat? Spanish- ¿Podemos vivir 150 años? Korean -150살까지 살 수 있을까? Czech -Je možné žít 150 let? German - Können wir 150 Jahre alt werden? 04/28 Dandelion - weed or healing aid? 03/30 Beat stress and be healthy!